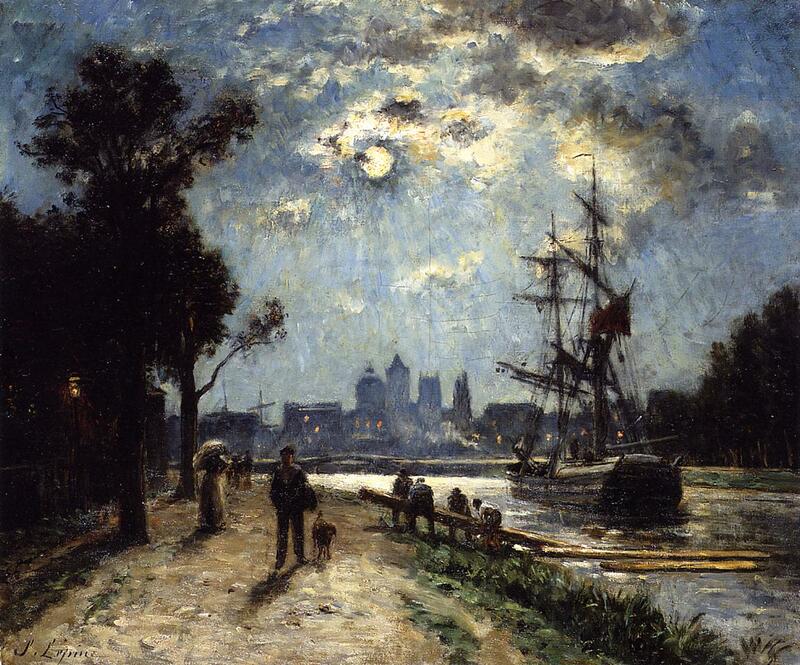 Stanislas Lépine (1835–1892), Caen, le long de l'Orne, cours Caffarelli, effet de lune (c 1876), oil on canvas, dimensions not known, Private collection. Wikimedia Commons. Another three names which have all but disappeared from the roll-call of Impressionism: this time a colour merchant who has completely vanished, a Napoleonic general’s grandson, and a pre-Impressionist taught by Corot. Little is known of Latouche, who should not be confused with the more famous Gaston de Latouche, a pupil of Félix Bracquemond whose Impressionist art flourished slightly later. He was a dealer in paintings who had a shop on the Rue Pigalle by 1864, and moved to premises in Rue Saint-Augustin the following year. After the Salon des Refusés in 1863, he organised a petition for a new Salon des Refusés in 1867, attracting the support of Pissarro, Renoir, Sisley, and others. In 1865 he started selling oil paints too, and among his customers were Pissarro, Monet, Gauguin, and Dr Gachet – who inevitably referred to his as Père Latouche. From 1868, he operated in premises in Rue Lafayette, and stopped selling paintings by 1884, concentrating on paints at the time of his death. He was also a painter himself, of landscapes and marines, but I have been unable to find any electronic images of his work. A good friend to the Impressionists, he became involved in the organisation of the First Impressionist Exhibition, and showed four works himself, none of which was given a title in the catalogue. After that group went into liquidation, he joined l’Union, organised by Meyer with Pissarro as its leading artist. The grandson of one of Napoleon’s generals, Louis Lepic, he had the hereditary title of Viscount. His father had been a close supporter of Napoleon III, and he had been expected to follow the family’s military tradition. He persuaded his father to allow him to train as a painter, first under Gustave Wappers, court painter to the King of Belgium, and eventually with Charles Gleyre (whose academy trained other Impressionists) and Alexandre Cabanal. From his youth he was good friends with Edgar Degas, who persuaded him to associate with the Impressionists. After a few years occupying himself with archaeology, including founding the Aix-les-Bains museum in 1872, he developed his techniques of etching, and painted mainly marine views. He exhibited in the First Impressionist Exhibition in 1874, but separated from the group afterwards because of its insistence that members did not show at the official Salon. In 1877, he started to pay annual visits to the beach resort of Berck, to the south of Le Touquet, not far from Calais, and many of his surviving paintings were made there. He is probably more widely seen (but not recognised) as a model for several of Degas’ paintings, including Count Lepic and his Daughters (1870), below, and Place de la Concorde (1875), which shows Lepic, his daughters, and their dog. 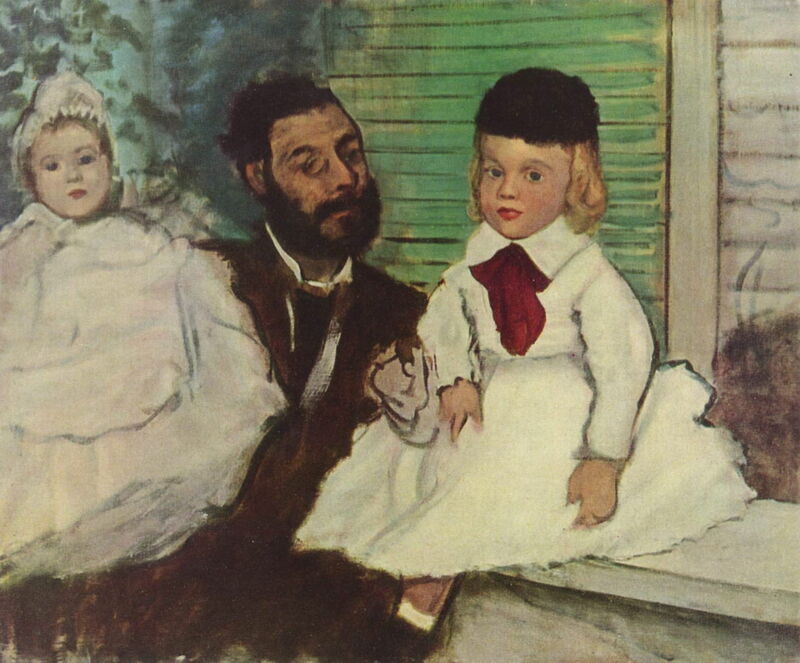 Edgar Degas (1834–1917), Count Lepic and His Daughters (1870), oil on canvas, 65 × 81 cm, Foundation E.G. Bührle, Zürich. Wikimedia Commons. On February 10, 2008, Count Lepic and his Daughters was stolen from the Foundation E.G. Bührle, Zürich, and was recovered in April 2012 with slight damage. Curiously Degas’ Place de la Concorde was believed to have been lost for forty years after the Second World War, but was then rediscovered. 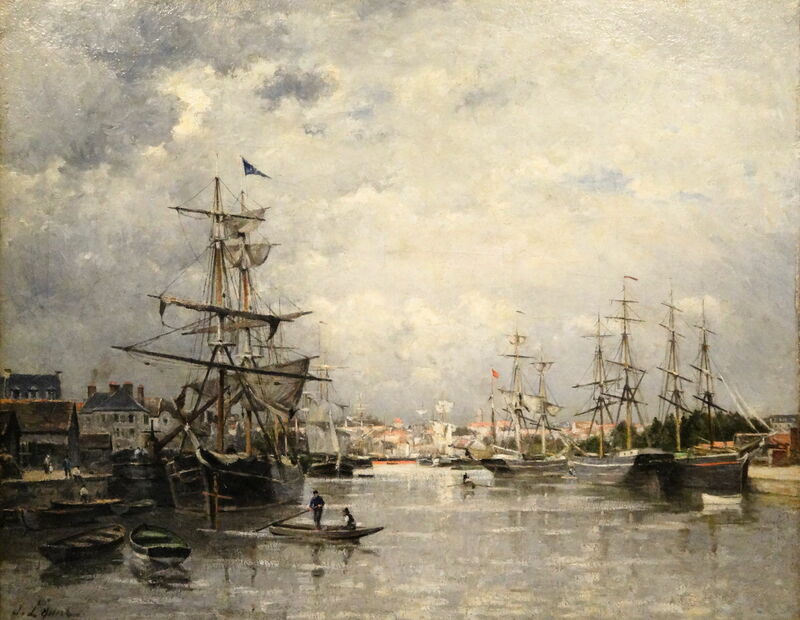 Lepic did achieve recognition as a marine painter, being awarded a silver medal at the Salon of 1877, having a large one-man show in 1879, and being appointed an official marine painter to the French State in 1883. Ludovic-Napoléon Lepic (1839–1889), Cesar (c 1875), etching, dimensions not known, Private collection. Wikimedia Commons. 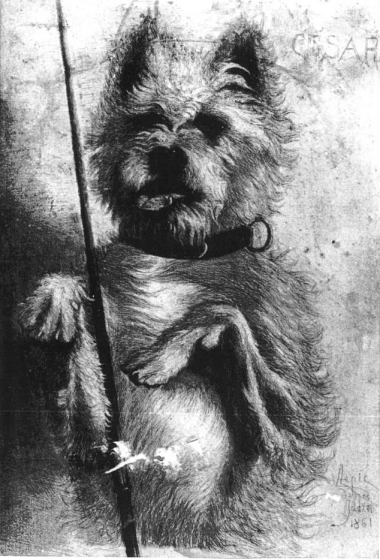 Cesar (c 1875) is a very accomplished etching, the result of his years developing techniques. Lepic and his family were often associated with this small dog, who also appeared in Degas’ paintings of him. Ludovic-Napoléon Lepic (1839–1889), Fishing Boat Entering Berck (c 1876), oil on canvas, dimensions not known, Palais des Beaux-Arts de Lille, Lille. Photo by Remi Jouan, via Wikimedia Commons. 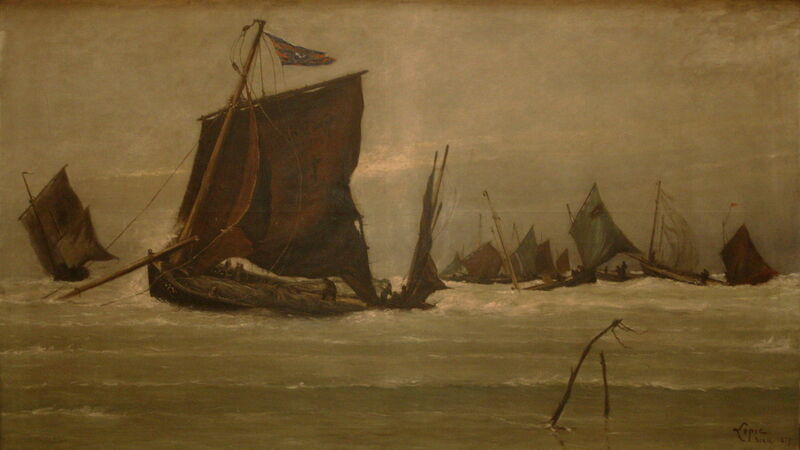 Lepic’s marine paintings, such as Fishing Boat Entering Berck (c 1876), were hardly in keeping with those of the Impressionists, although they did eventually achieve recognition. Ludovic-Napoléon Lepic (1839–1889), Berck Beach (1876), oil on canvas, dimensions not known, Palais des Beaux-Arts de Lille, Lille. Wikimedia Commons. 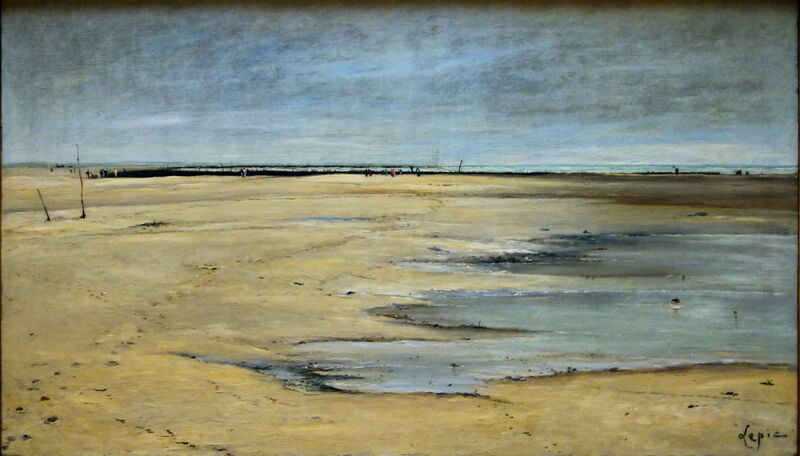 His paintings of the sands at Berck, here in his Berck Beach (1876), were brighter, but invariably scenes of desolation. The very few beaches among Degas’ few landscape paintings are remarkably similar, and devoid of life. Ludovic-Napoléon Lepic (1839–1889), The Wrecked Boat (1877), oil on canvas, other details not known. Wikimedia Commons. 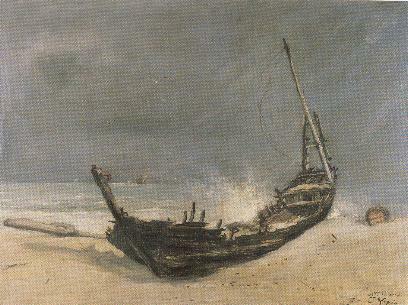 Apparently very small in size, The Wrecked Boat (1877) may have been painted as a plein air sketch. Ludovic-Napoléon Lepic (1839–1889), La plage de Berck au pliant (1877-9), oil on canvas, dimensions not known, Private collection. Wikimedia Commons. 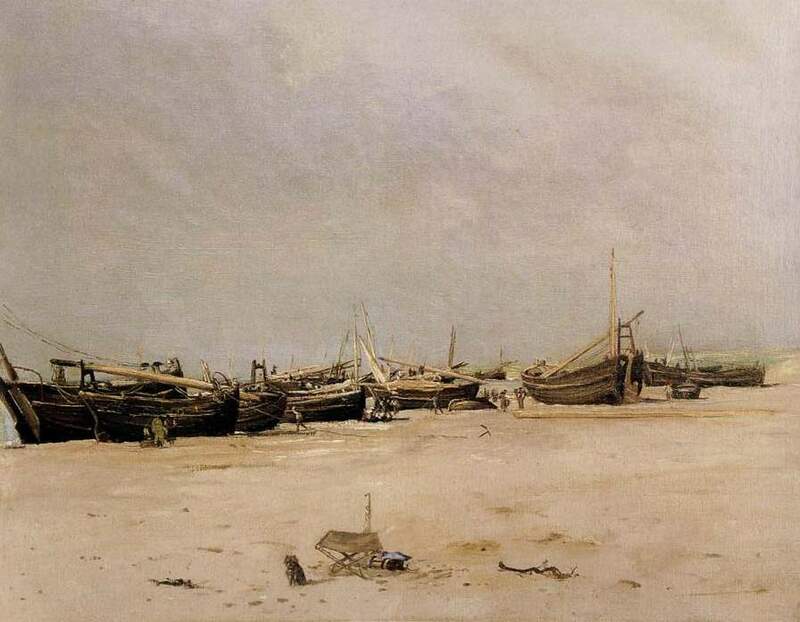 In his La plage de Berck au pliant (1877-9) the stepped masts of fishing boats make them appear abandoned and derelict, although it was common practice to avoid storm damage. Born the son of a cabinet maker in Caen, on the Normandy (northern) coast of France, he became friends with Adolphe-Félix Cals and Théodore Ribot when a young man; he was also strongly influenced by Jongkind. He first met Corot in 1859, when he succeeded in having paintings accepted by the Salon, and became Corot’s pupil. For much of his career he painted views of the River Seine, including a number by moonlight, which was recognised as his speciality. Although he took part in the First Impressionist Exhibition in 1874, he was not generally considered to paint in impressionist style, being more pre-Impressionist. Count Doria was his main patron, and Durand-Ruel one of his dealers, but his paintings did not bring him a comfortable living. He finally achieved wider recognition when he was awarded a First Prize medal at the Exposition of 1889, just three years before his death. Stanislas Lépine (1835–1892), The Port of Caen (detail of centre of triptych) (c 1859), oil on canvas, dimensions not known, Musée des Beaux-Arts de Caen, Caen, France. Wikimedia Commons. The Port of Caen (c 1859) shows the detail of the centre part of a triptych painted in careful realist style, and was probably one of his paintings accepted for the Salon. 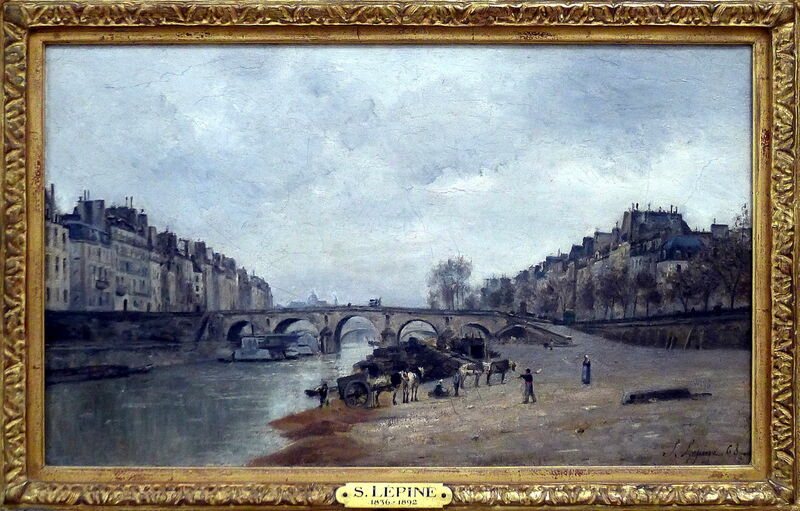 Stanislas Lépine (1835–1892), Pont de la Tournelle, Paris (1862), oil on canvas, dimensions not known, The National Gallery of Art, Washington, DC. Wikimedia Commons. He painted several views of Pont de la Tournelle, Paris over the years. This version of 1862 is fairly traditional in composition, showing the morning light on the buildings along the west bank. 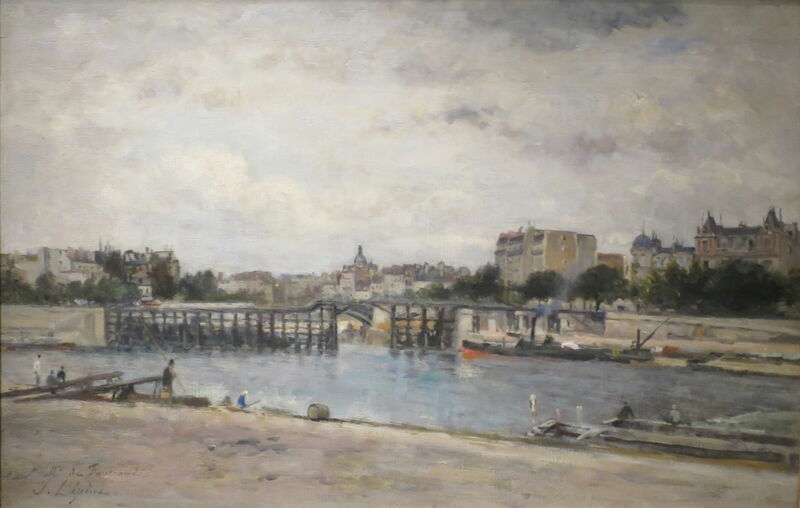 Stanislas Lépine (1835–1892), Pont de la Tournelle, Paris (1862-4), oil on canvas, 13.7 x 24.4 cm, The National Gallery, London. Courtesy of the National Gallery (CC). This version of his Pont de la Tournelle, Paris (1862-4) is slightly later and less conventional in its composition. Stanislas Lépine (1835–1892), The Quay, Pont-Marie, Paris (1868), oil on canvas, dimensions not known, Musée d’Orsay, Paris. Wikimedia Commons. Lépine’s The Quay, Pont-Marie, Paris (1868) is another finely-painted but clearly non-Impressionist view of the Seine in Paris. Compare that with Guillaumin’s Pont Marie, Quai Sully (1878) just a decade later, for example. 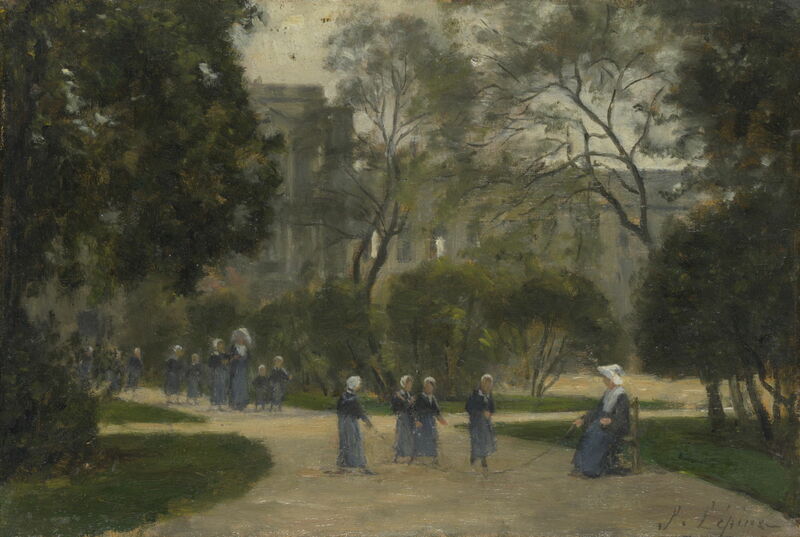 He also painted some views around other parts of Paris, including this rather dark assembly of Nuns and Schoolgirls in the Tuileries Gardens, Paris (1871-3), which looks decidedly Barbizon in style. 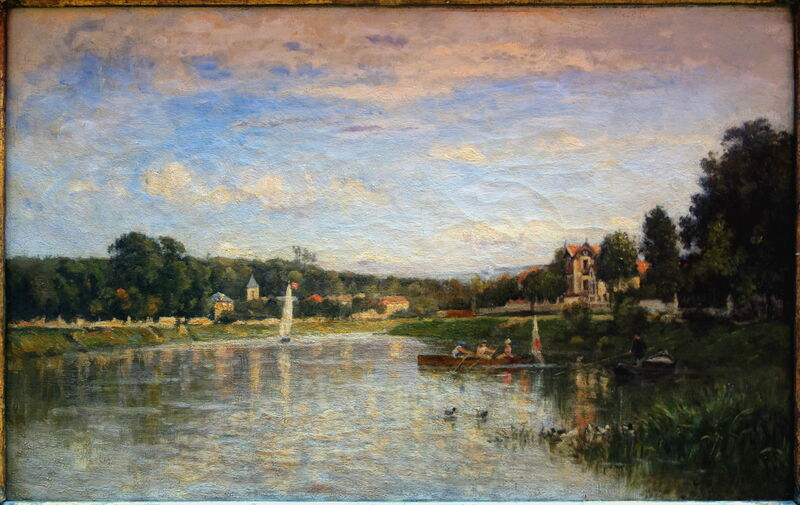 Stanislas Lépine (1835–1892), Brie-sur-Marne (1873), oil on canvas, 38.5 x 60 cm, Palais des beau-arts de Lille, Lille. Wikimedia Commons. Brie-sur-Marne (1873) probably comes closest to Impressionism of the paintings of his which I have found. He became well known for his spectacular moonlit scenes, such as Caen, le long de l’Orne, cours Caffarelli, effet de lune (c 1876), although even they did not sell as well as he had hoped. 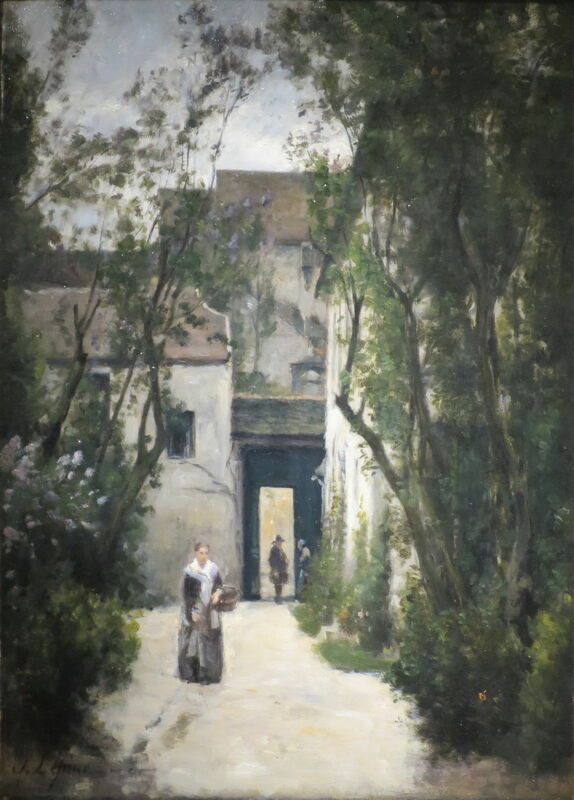 Stanislas Lépine (1835–1892), A Courtyard on the Rue de la Fontinelle (1874-8), oil on canvas, 44.5 x 31.8 cm, The Norton Simon Museum, Pasadena, CA. Wikimedia Commons. A Courtyard on the Rue de la Fontinelle (1874-8) was more of a departure from his other work, showing the quiet intimacy attained by many of the small courtyards in Paris. 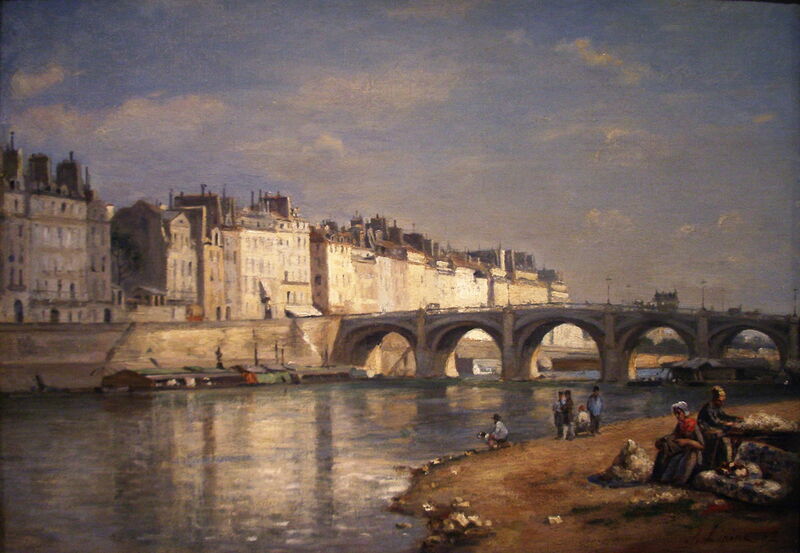 Stanislas Lépine (1835–1892), The Pont Neuf, Paris (1875-9), oil on canvas, 22.9 x 33.0 cm, The Norton Simon Museum, Pasadena, CA. Wikimedia Commons. The Pont Neuf, Paris (1875-9) is his take on one of the best-known bridges in central Paris, near the Louvre. 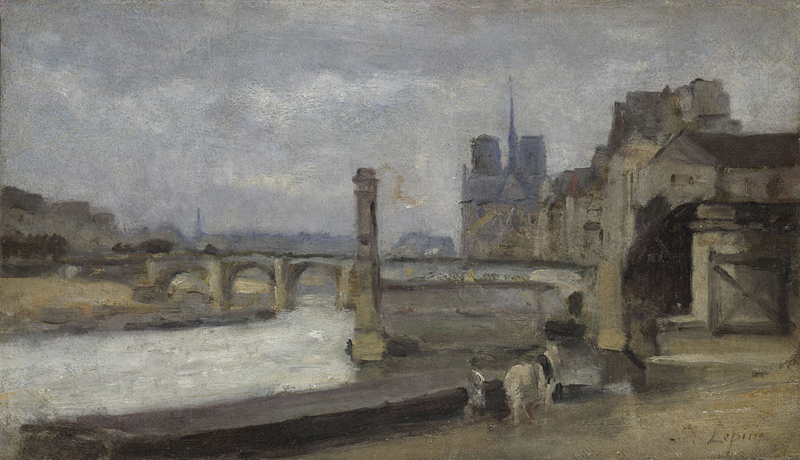 Stanislas Lépine (1835–1892), The Pont de l’Estacade, Paris (c 1880-4), oil on canvas, 27 x 41 cm, The Norton Simon Museum, Pasadena, CA. Wikimedia Commons. 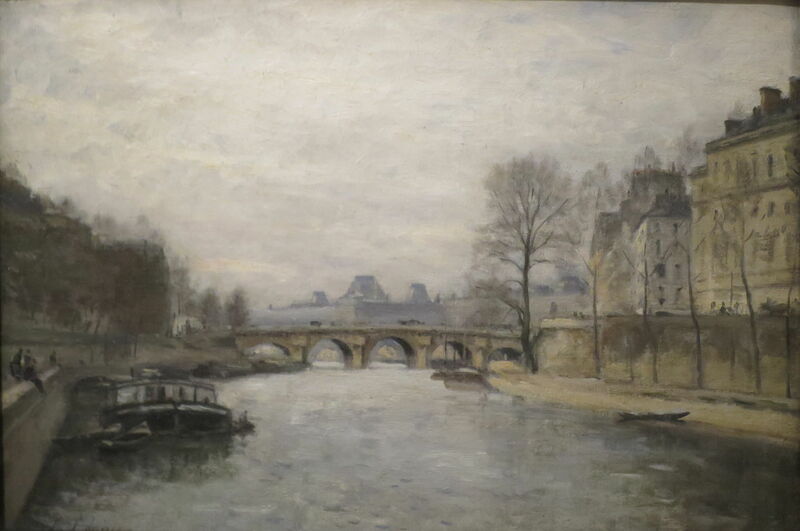 He also painted some of the less well-known bridges, including The Pont de l’Estacade, Paris (c 1880-4). This Passerelle was constructed in 1818 to try to protect boats from ice damage, and was demolished in 1932. Posted in General, Painting and tagged Degas, etching, exhibition, Impressionism, Latouche, Lépine, Lepic, Napoleon, painting, unknown, vanished. Bookmark the permalink. I believe I may be able to help you out with an image of a work by Louis Latouche. I have a framed landscape, oil on canvas. It is in its original frame, with a Latouche brass placard. There are two small paintings to make a set, if you will. They aren’t signed. Although I have never really studied and compared them, I always assumed they were not done by the same artist. I will take a more serious look. Feel free to let me know if you still have an interest in an image of a painting. I’d love to see a digital image of it, please. My email address is given in my About page.